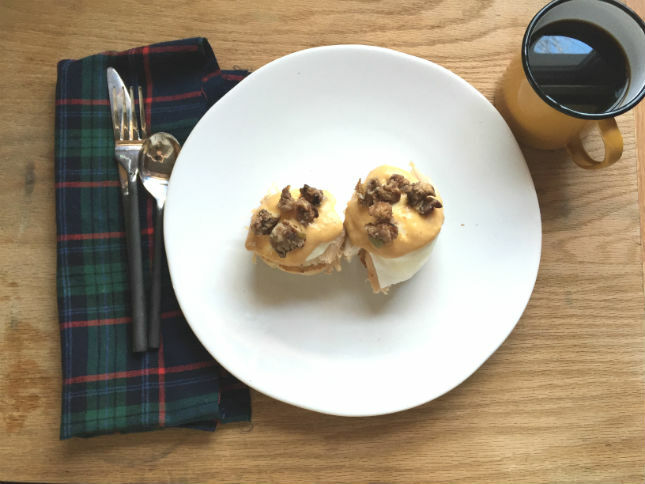 Turkey is literally the last thing I want to think about right now, but I have to share this thanksgiving eggs benedict recipe before you plan on using your turkey and stuffing leftovers for the same old, same old sammies tomorrow. Leftovers are a big deal in our house. They’ve become one of our first traditions. Like sometimes I think they’re better than they were during the actual t-giving meal. We debate over and over about how we should use them. Should we try burritos? Or maybe recreate the mashed potato pizza from one of our favorite pizza joins in town? 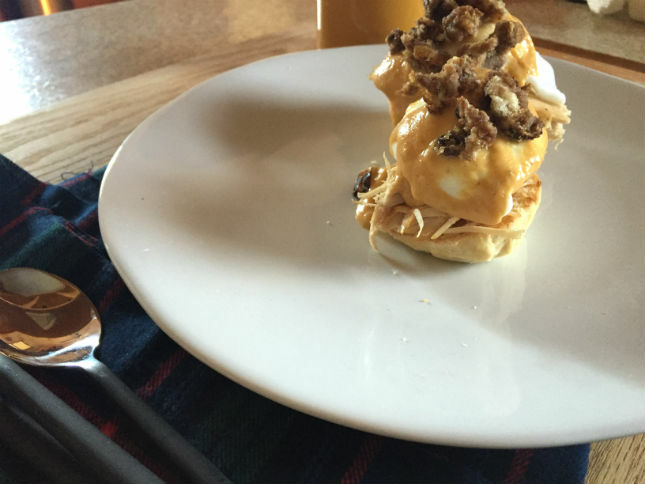 This year we took a stab at a breakfast version. 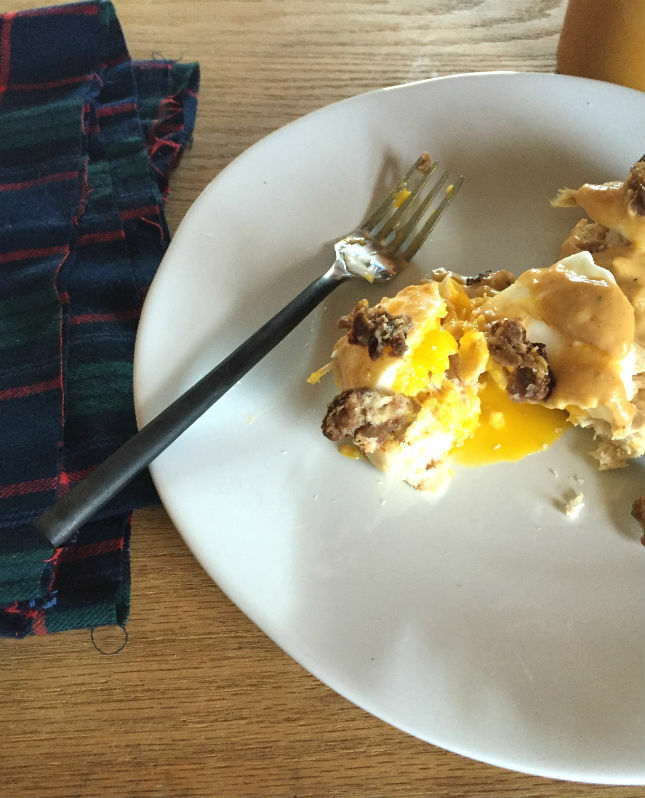 Normally I just go piece of pumpkin pie the morning after, but turkey eggs benedict sounded too good to pass up. 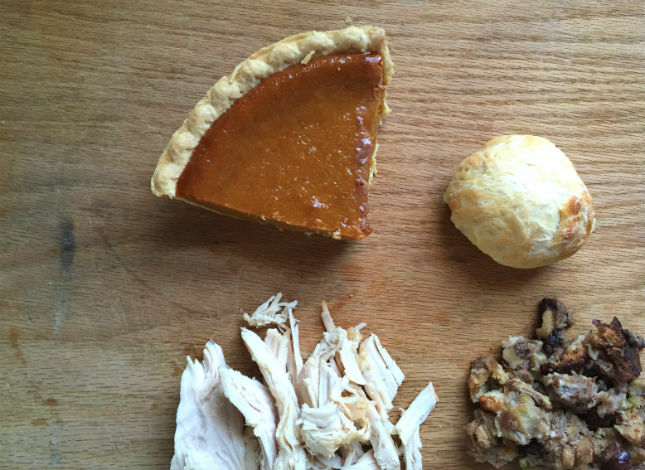 It was perfect combination of sweet and savory and literally thanksgiving in every bite. 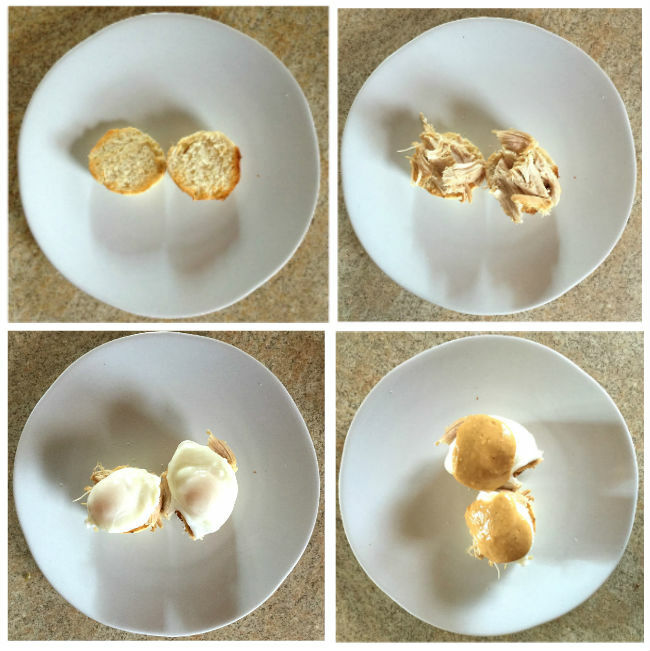 Start with your poached eggs. It’s actually really easy to poach an egg. I’d never done it before. I used this tutorial and it worked perfectly the first time. As the egg is poaching, make your sauce. I just combined two parts gravy to one part pumpkin pie (about a 1/4 cup of gravy and a sliver of pie with the crust) and pulse a few times in a blender. If it’s too thick, thin with a little milk and warm in microwave or on stove top. Warm up the the turkey. Fry up the stuffing in some butter to make a stuffing-esque croutons. Arrange from bottom to top: biscuit, turkey, egg, gravy mixture and stuffing croutons. The best part is you really can use whatever you have. Stick with the basics: egg and turkey and go crazy with whatever else you have. Maybe use cranberries for a sauce or mashed potatoes cakes instead of biscuits. However you eat it, it’s gonna be good.